Disney experiences and consumer products chairman Bob Chapek confirmed Wednesday at the International Association of Amusement Parks and Attractions convention that the long-gestating attraction — set to become Epcot’s first roller coaster when it debuts in time for Disney World’s 50th anniversary celebration — will feature an “innovative” ride design that will allow park guests to “become part of the [ride’s story]” unlike ever before. 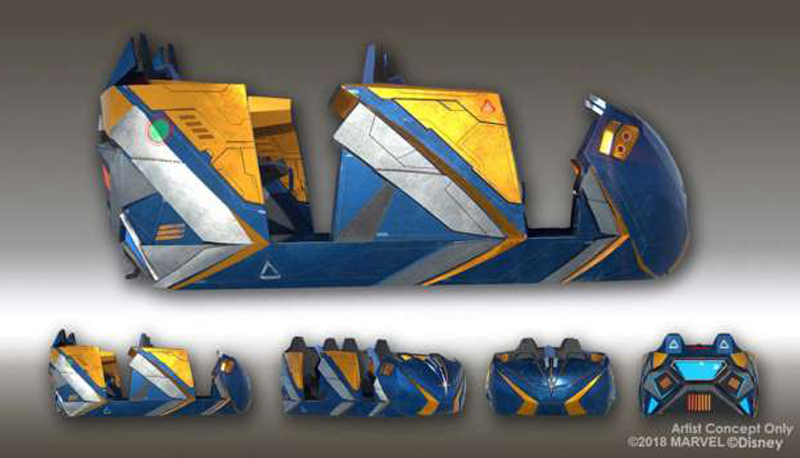 Chapek then debuted a series of images showing off the ride’s car designs, which are modeled after the Milano Starship from the Guardians of the Galaxy series of films upon which the attraction is based. “Instead of whizzing by the action, you’ll be fully immersed in the story from the minute you launch,” Chapek continued of the ride, which was designed in collaboration with Vekoma (the company behind the Expedition Everest coaster at Animal Kingdom) and will be housed inside a massive indoor building that’s large enough to fit four of Epcot’s Spaceship Earth attractions inside. Disney’s IAAPA presentation also included video footage from a testing facility, in which a version of the Guardians of the Galaxy ride’s coaster trains can be seen spinning as they traverse a twisted course of track. Following 35 years of operation, Epcot’s Universe of Energy pavilion — which, beginning in 1996, also housed the Ellen’s Energy Adventure ride starring comedian Ellen DeGeneres — ceased operations in August 2017, with its show buildings ultimately repurposed for the ambitious Guardians of the Galaxy coaster. The ride will open as part of Disney’s previously announced plans to revamp Epcot into a more accessible, family friendly destination, a transformation that will begin with the alteration of the park’s Future World section. Further development includes a Ratatouille-themed dark ride — a clone of a similar ride currently operating at Disneyland Paris — also scheduled to open in 2021 in the World Showcase’s France pavilion. Elsewhere, the Orlando-based resort will open a Tron-themed roller coaster next to Space Mountain at the Magic Kingdom in the near future as well as a Star Wars land at Disney’s Hollywood Studios in summer 2019.